But those who pushed past casual into serious fan quickly learned the English singer-songwriter had not only been around quite some time, but planned to stick around even longer. deep into his 25-year career, Gray has released The Best Of – a blend of the well-known tracks with some of his lesser known early (and late) work. And to spice it up, he’s thrown in a couple new tracks as well. We’ll feature Gray all day tomorrow on our weekly “New Tracks on the Trail” feature. -Suzanne Vega: Work from the eclectic American singer-songwriter’s new album, Lover, Beloved: Songs from an Evening with Carson McCullers. Vega and Duncan Shiek produced a play about the Southern author in 2011, and the new album – her ninth – is based on that effort. Check out The Guardian’s review of Lover, Beloved HERE. 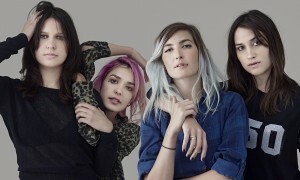 -Warpaint: A few tracks off the indie rockers’ third studio album, Heads Up. For an idea, check out their video from 2011 hit “Elephants” HERE. -Matt Hires: Finally, we’ll dish out some new material from an American singer-songwriter with a unique voice who lists Tom Petty, Bob Dylan and Jason Isbell among his greatest influences. Check out the PopMatters review of his new album, American Wilderness, HERE. There ya have it – another Tuesday, another round of new tracks. Big thanks to Rockin’ Rudys for sponsoring!